You’ve probably had your first taste of artificial intelligence from science fiction films that depict robots gaining sentience through the wonders of the technology. This is still far from happening in the immediate future, but it wouldn’t be surprising if such advancements are actually achieved. But as far as we are from having sentient robots that might take over the world, artificial intelligence has already made it relatively far from the day it first came to be. There are emerging trends with the technology across various industries as it’s utilized to improve different processes. 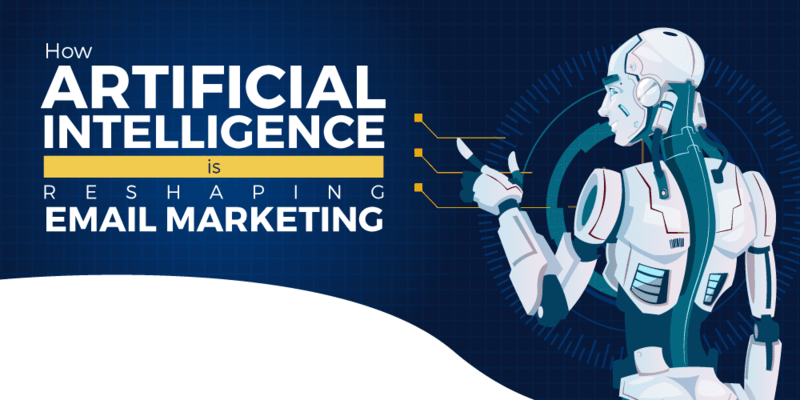 In the field of digital marketing, artificial intelligence plays a crucial role, particularly when it comes to email marketing. Sending emails has been an integral part of digital marketing for its direct approach and cost-effective methodology. With the help of artificial intelligence, email marketing is more powerful than ever. It has introduced several benefits to garner higher conversions, including personalization, automation and data analysis. To give your email strategy that extra boost for more favorable results, AI is key in upgrading your email marketing tactics. AI-powered systems make it possible to set up automated or drip campaigns that are driven by customer data and are based on what stage someone is at in the customer journey. The technology uses past purchases, interests and browsing behaviors to set up automated campaigns that are designed to nurture your leads. AI can also help you determine what kind of content and images that are going to be most effective in drafting your welcome emails, order update emails and retention emails among others to achieve the highest amount of engagement and conversion possible. Some of the most successful email marketing campaigns are focused on creating emails that look like they were written personally by humans rather than being machine-generated. AI technology helps analyze consumer behavior and study their interests to generate data-driven insights. This makes it possible for you to create customized emails that are tailor-made for each of your individual subscribers. Subscribers are more likely to skip your email if it doesn’t tickle their fancy. In other words, AI can tell you what content is needed to resonate most with your target audience at a personalized level. The best way to gather data for an effective approach to this method is to ask them to set their preferences while signing up or after they’ve received their welcome email. Both personalization and automation of an email marketing campaign wouldn’t be possible without the help of big data. You don’t have to be a big company to deal with this kind of concept, especially if you’re trying to segment your subscribers to create more personalized emails. With email marketing becoming more common than ever, it’s getting more difficult to make your emails worthy of your subscriber’s time since they are receiving a huge amount of emails daily. But with the help of big data, you’ll have a chance to stand out from the noise. Segmentation is possible through the data your subscribers provide when they sign up. But aside from this, you can also gather more personal data that will help you with drafting bespoke email content. Cookies from website visitors and the pages they’ve visited are some of the essential information you can use to gain deeper insights about your target audience. Analysis of huge sets of data can help you avoid bombarding subscribers with mass generic emails in the future. With personalization and unique content as your point of focus, you’ll be able to stand out from all the clutter they receive from other marketers on a daily basis. The standard practice of email marketers involves manually testing the right combination of a subject line, email body and images to find out which email would perform best for a specific audience. For obvious reasons, this was a tedious process that was prone to human error. AI technology now aims to improve this process by quickly generating content that would bring the best results in terms of conversion and revenues. This now cuts precious time from testing and allows you to work with more combinations of messaging elements. Sending your subscribers frequent emails boosts the likelihood of them opting out, but if you send too few, you risk being overtaken by the competition. AI takes the guesswork out of the equation and determines the right times to automatically send out emails based on your subscribers’ activity history. AI technology can also factor in the time zones, down times and the personal habits of your subscribers to correctly calibrate the schedule of sending out your emails. Ultimately, it’s important to remember that you’re trying to connect with humans who have different habits and preferences from each other. AI knows what promo works best with each of your customers based on their history, interests and habits, whether it’s product recommendations, discounts, freebies, or rebates. When a customer abandons a shopping cart, AI can retarget that customer by sending an email either to have them reconsider and finally purchase the product or recommend a similar item. Emails will have a CTA that leads to a landing page where your customer can easily complete the purchase. Thanks to the AI that’s set to make product recommendations, the probability of conversions is significantly increased. Machine learning helps marketers group their subscribers based not only on basic information such as age, location and purchase history but also on specific behavioral signals. These subtle behavioral patterns can be turned into new and distinct marketing segments that could be treated with updated customized campaigns. For a more detailed discussion on how artificial intelligence is reshaping email marketing as we know it, take a look at this handy infographic from Connext Digital. Jess Andriani works as a Marketing Manager at Connext Digital. She believes that every day is a chance to learn something new. In her free time, she writes about Digital Marketing.